Thank God for different approaches to telling jokes. In a comedy universe that ranges from high octane in-your-face comedy club stand-ups to improv to sitcoms et al, Mike Birbiglia carves a niche by being an amiable “rambler” of a story teller. But make no mistake, Mike Birbiglia‘s Thank God For Jokes is a carefully crafted ramble where every destination is appealing and all roads eventually converge and lead to a satisfying destination. In Thank God for Jokes, Mike Birbiglia weaves numerous stories from his life that all connect to a theme of “what limits if any, should be applied to the jokes that we tell, when can they be told, and who has the right to tell them.” His tale comes into focus around an awards show that he was hired to host. In doing so he tells a joke that rankles the director who was there to receive a lifetime achievement award. But Mike argues that his loyalty was to the joke more so than to currying favor with the honoree. 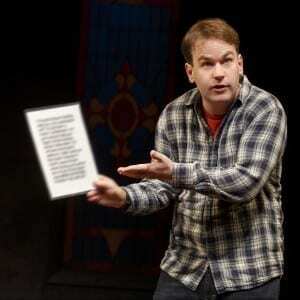 It is Birbiglia’s verbal peregrinations that enchant. In this consistently funny and smart show he seems to tangentially wander topic to topic, but this is a very carefully mapped out journey — one where the various stories all tie together to make a point about the sanctity of the free speech that are jokes. I suggest you make pilgrimage to the Culture Project to exercise your right to hear free speech, specifically that of Mr. Birbiglia. And arrive on time — Mike has a riff that involves dividing the world into late and on-time people (this reviewer sadly being in the former category) — to see Thank God for Jokes. Mike Birbiglia: Thank God For Jokes, a new show written and performed by Mike Birbiglia, at the Lynn Redgrave Theater (45 Bleecker Street at the corner of Lafayette Street); 866-811-4111. Directed by Seth Barrish, set design by Beowulf Boritt. Mike Birbiglia: Thank God For Jokes is produced by Mike Berkowitz, Joseph Birbiglia, Ron Delsener, and Mike Lavoie. TGFJ Runtime- 90 minutes. Performances will continue through March 13.